About 2,000 homes and businesses have been destroyed by the fires in Northern California. The largest of the 2017 California wildfires were burning in Sonoma, Napa, and Mendocino counties, with flames ripping through the lush, picturesque landscape. And causing more than 20,000 people to evacuate Northern California. The above photo was taken in Napa county after first responders directed Stars of HOPE to leave the message for a family in need of a loving message of HOPE. Stars of HOPE focuses on the fourth element of recovery. Going back home after disaster can be the saddest thing. It is so hard to come back to see homes and businesses decimated. BUT you can help bring color and messages of Hope, Empowerment to rebuild, and healing to those feeling alone. Often Stars of HOPE become a survivors first piece of personal property. Inspiring them daily to keep hope and strength to rebuild. Your Star of HOPE makes the impact someone needs. Click here to order your Stars of HOPE Box of HOPE to support California. Unfortunately, many individuals and families struggle alone throughout the process of rebuilding. Your Stars of HOPE act as a daily reminder of strength to have hope. The unique approach behind Stars of HOPE is that we took a simple art project and turned it into a public art display in a disaster zone. This allows us to give inspiration and emotional support to thousands of disaster survivors within devastated communities who see these messages of encouragement and compassion throughout the long-term recovery phase of disasters. 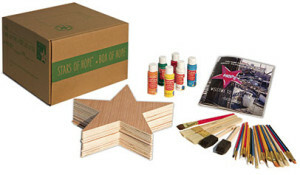 Where do I send my Stars of HOPE after I have painted them for California?